Neustar IP Intelligence decisioning data can help you reduce friction throughout the entire customer journey. The hallmark of an exceptional online customer journey is a "frictionless" experience at every point of customer interaction - from registration to checkout. With the power of Neustar's IP Intelligence decisioning data you can accurately determine the location of a new prospect as well as returning customers, while identifying them at each step in their journey throughout your site. By quickly identifying your good customers, while blocking access to known "bad actors", you can reduce the need for high-friction, knowledge-based authentication (KBA) questions and identity verification processes. Your challenge is to make sure both prospects and customers have the best possible experience on your site. You must be able to accurately determine where a prospect or customer is located by using their IP address, in addition to determining if the IP is being used by a human being or if it's non-human, like a bot, or server traffic. Neustar IP Intelligence decisioning data gives you the power to ensure your high-value returning customers can quickly access your site, while blocking those that appear to present unacceptable risks to your business. You're likely responsible for selecting the IP decisioning data that will be integrated into the platform. This means you need to be confident the data provider you choose has the resources and data quality to support your internal team, plus the Product, Marketing, Security and Fraud teams. Neustar not only has insight on over 99.99% of all routable IPs, but we also have a Professional Services team available 24/7 to help support you during design, production, QA and maintenance. In addition to tracking metrics on conversion, retention, revenue and growth, your team is measured on customer satisfaction and loyalty by an annual Net Promoter Score (NPS) survey. Since customer experience has a significant impact on satisfaction, integrating accurate decisioning data that will reduce customer friction is important to you. Neustar IP Intelligence reduces friction throughout the online customer purchase experience. It also gives your Marketing team the ability to develop targeted campaigns and promotions based on the user's location, and organization type, anywhere in the world. Your team handles questions - and complaints - about your company's online offers. If a visitor cannot create an account, your team gets the call from the frustrated prospect. If a current customer is being blocked from accessing their account, your team gets the call from the even more frustrated customer. If inaccurate IP geolocation data leads to a customer unnecessarily being locked out of their account - or sent to a fraud review queue - you just know that is going to impact the customer experience and drive up your call volume. Accurate, high-quality IP geolocation data not only helps customers with their online experience, but it also helps lighten the load on your customer care team. Based on the IP information provided by Neustar IP Intelligence, Catalina Labs gives its users a way to identify their location, enhance their WiFi performance, and even compare their WiFi performance to surrounding areas. Learn how accurately identifying your customers can take your online customer experience up a notch. 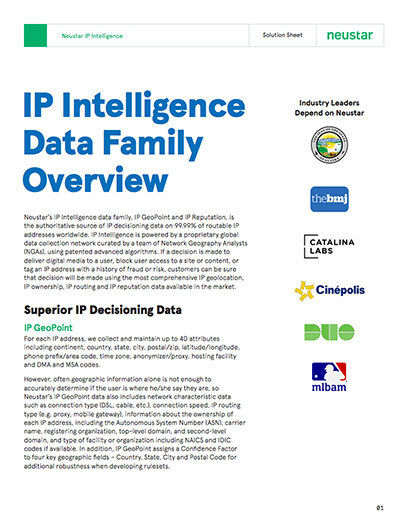 IP Intelligence provides granular IP decisioning and Internet connectivity data, answering who, what, where, when and why consumers are connecting to your site. IPI helps sort out the good actors from the bad, improving the customer experience while keeping vital security systems safe and efficient.